Cambridge: Crossway Books, 1992. . 54 pages, on the nature of the church and how to choose one. By the then President of the Fellowship of Independent Evangelical Churches.. First Edition. Paperback. Good. Bromley: STL Books, 1982. . 95 pages, paper browned.. Revised Edition. Paperback. Average. London: Church Pastoral Aid Society: Falcon Booklets, 1969. . 36 pages, for those leading women's meetings.. Pamphlet. Good. Crieff: The Research Unit, 1971. . 184 pages, slight foxing to page edges. About the history, work, personality, and attitudes of beadles or "church officers" in the Church of Scotland and other historical churches which united with it.. Cloth. Average Plus. London: Falcon Books, 1970. . 59 pages. "In well meaning endeavours to 'minister' to patients and friends in hospitals, Christians can be guilty of terrible mistakes. 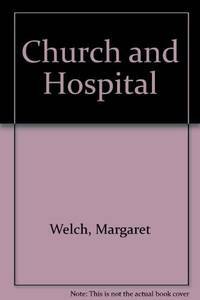 This book, written by a nurse, sets out how a hospital works and suggests how Christians can play their part in bringing healing to the whole man.". First Edition. Paperback. Very Good.